In celebration of the current selfie culture, The Immaculate Selfie, an exhibition curated by Project Gallery director Devan Patel, explores self-portraiture in art. The show features mostly young Canadian contemporary painters (both digital and analog), photographers, and printmakers. Denelle Kennedy, Celfie 3, 2014, photograph, 20 x 20 inches. Courtesy of the artist. Because the exploration of self-portraiture has always been important in the art practice, and today it is ever so present in pop culture with Millenials at the forefront of the selfie culture, it is important to recognize The Immaculate Selfie as an important exhibition of contemporary art in this day and time. Not to mention the diversity of the show, which reflects the current multiculturalism of Toronto. Artists have always explored themselves as the subject of their work, whether through a direct depiction of themselves (like Frida Kahlo’s portraits), or through more abstract forms of expression (like Cindy Sherman’s roleplayes). As stated by Devan Patel, there is more or less an aspect of narcissism in self-portraits, and to those simply admiring the work, the narcissistic quality is evident. But it isn’t always a bad thing and self-portraiture can have deeper meanings below the shallow layer of narcissism, and this is exactly the message that this exhibition successfully portrays. 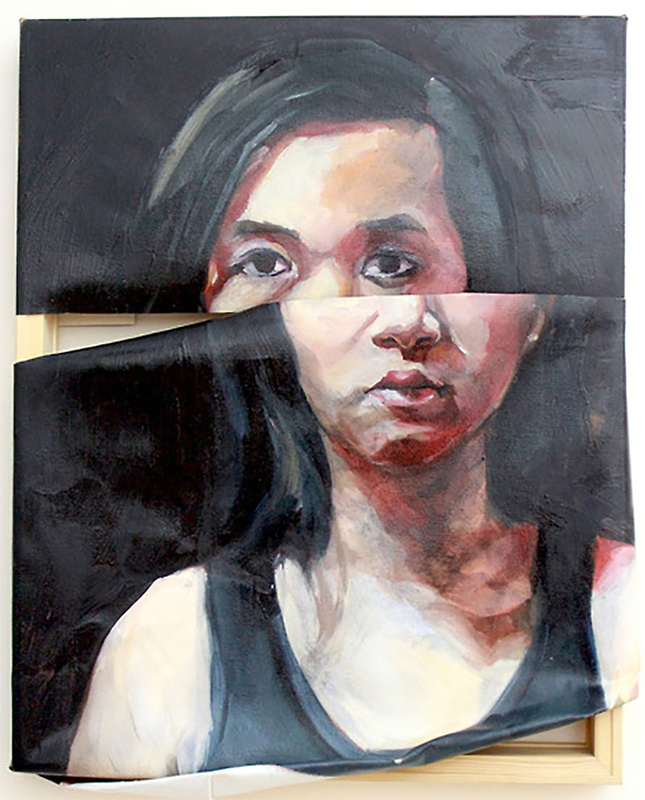 To artists, self-portraiture is also a chance to explore their inner selves. The final piece represents an understanding of the Self, sometimes through a variety of interpretations, and at that moment when the viewer sees the artist’s work, they become vulnerable before us. Stella Cade, Sweat, Sweat (left) and Contact (right), 2014, oil on canvas, 30 x 24 inches. Courtesy of the artist. Some of the artists were present at the opening reception to speak to me about their work, such as Stella Cade, who has been working with self-portraiture for about 6 years. Her two paintings were made in June, as part of an ongoing series exploring identity and self-critique, and she wanted them to adopt the feeling of the mid-summer sun’s heat, and the inevitability of sweat when moving in such conditions. When staring at the paintings, I feel the sweat that might be causing her discomfort through her gaze and unkept hair. The powerful blue in the background does cool down the painting a bit though, like air conditioning, which only captures the essence of mid-summer even more. I also had the pleasure to speak with Shawn Keir, an exhilarating personality who creates energy-driven work based on how he feels in the present moment. In each phase of the painting, he used color and line to depict the emotion that he was feeling at the exact moment he was working on it—he literally paints himself in the moment. Shawn Keir uses color in his paintings exceptionally well, and it is probably the best aspect of his work. Kimberley Lillywhite, Turbulence, 2014. Courtesy of the artist. 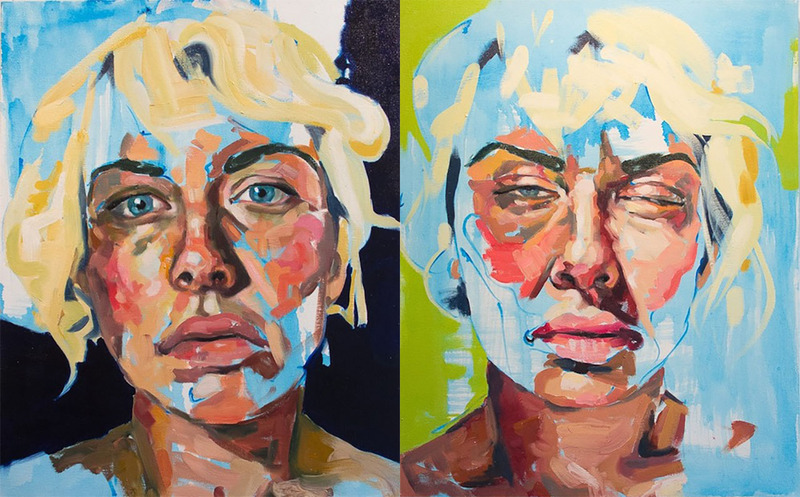 There was also Kimberley Lillywhite, whose work is heavily influenced by structure and design, showcasing a painting called Turbulence that is part of a series of three abstract self-portraits. 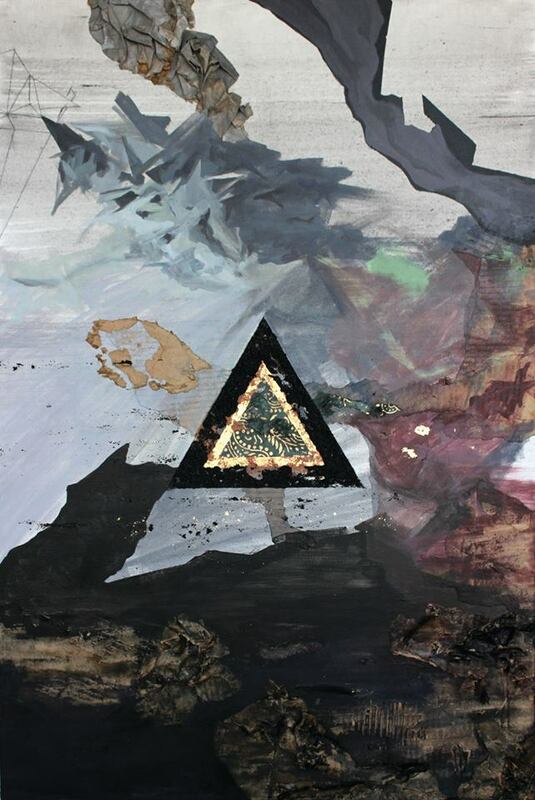 In Turbulence, life’s chaos—represented through several textures of muddy greys, browns, and black – finds balance through the triangle, the central figure of the piece, which represents the center of her being. For Lillywhite, the triangle is a solid shape that draws in The Now; the act of being in the present moment and finding your center amidst all the troubles life gives us. Phoung Nguyen’s Untitled also gives us the troubled feeling of being confused, out of balance and not able to compose ourselves – a common state of our contemporary mind. Phuong Nguyen, Untitled, 2014, oil on canvas, 20 x 16 inches. Courtesy of the artist. *Exhibition information: September 25 – October 3, 2014, Closing reception: October 3, 2014 / 7 – 11 p.m., The Black Cat Gallery, 2186 Dundas Street West, Toronto.